According to REM Air Conditioning of Tampa, a Florida certified hvac contractor, in some cases, air conditioner replacement could save up to a whopping 50% on your utility bill. This amount is astronomical if you consider the savings amount over a period of years. You could potentially send your child to college, get a new big ticket item, or pay off your mortgage with the amount of money you could save just by replacing your air conditioner. When Is the Right Time to Replace an Air Conditioner? There are several things you need to look at to know if it’s time to replace your AC unit. The first thing you need to look at is the age. Older models are not energy efficient, and a new model will allow you to be eco-friendly while saving money at the same time. If you have had to make multiple repairs to the unit within a short period of time, then that is also an indicator that it might be time for a replacement. If the temperature fluctuates from room to room, then that is a sign that the equipment is not functioning properly. This could be due to the unit itself or to duct problems, but either way it needs immediate attention. 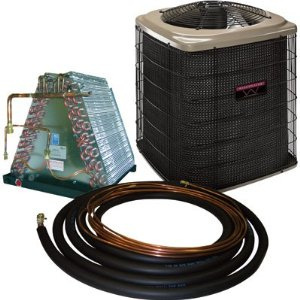 If your AC unit is incredibly loud, or if it seems to run continually, then it is probably a good idea to replace it rather than to repair it. A replacement air conditioner that has a programmable thermostat is a much more ideal choice. You will also want to ensure that the replacement unit is the correct load capacity for the size of the area that you will be cooling. If your home seems uncommonly humid, then you most likely have issues with both the AC unit and the duct work in your home. You can also tell that your equipment is having issues if your home becomes excessively dusty. Sealing the ducts or changing filters can usually help this problem, but typically homes that have this problem need to replace their equipment anyway, because it is usually outdated. The final sign that will tell you if your equipment is faulty is if your equipment seems to be running hot. If your equipment is working correctly, then the air in your home should be crisp and cool. A contractor will give you a free estimate to replace your equipment, and it may be one of the wisest investments that you have ever made. © 2019 HVAC ePrimer. All Rights Reserved.